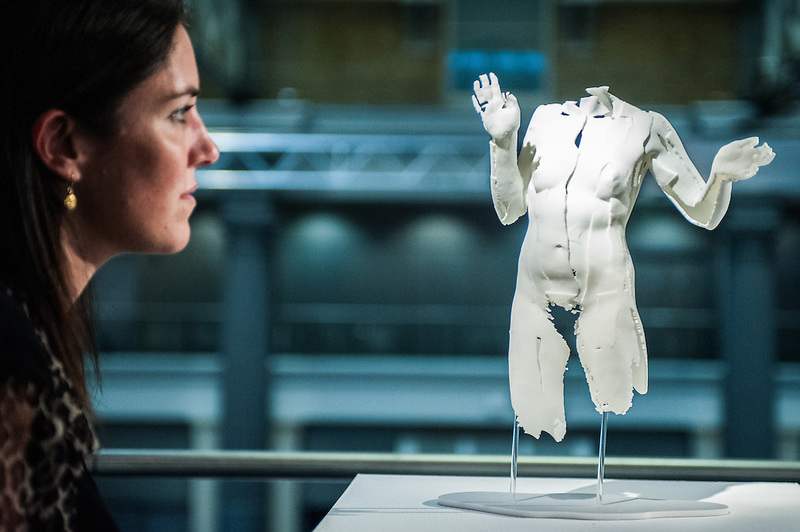 A woman looks up at a 3D printed model part of the project Prodromes by Sophie Kahn during the 3D Printshow at the Old Billingsgate in London. 3D Printshow brings together the biggest names in 3D printing technology alongside the most creative, exciting and innovative individuals using additive processes today. 3d 3d print 3d printer 3d printing additive manufacturing application booth britain british business company event exhibition futuristic graphics highlights innovation innovative london new object objects pavilion pioneering print printing process product products real-time scanning show showroom stand stereoscopic technology trade united kingdom fotografo a milano fotografo milano fotografo milano centro fotografo lombardia fotografo "milan photographer" "photographer in milan" "photographer in bergamo" "photographer milan" "photographer milano" "photographer in milano" "italian photographer" "photographer in italy" "photographer in lombardy" "fotografo a como" "fotografo a pavia" "fotografo a bergamo" "fotografo a trieste" "photographer trieste" "fotografo di milano" "fotografo a milano" "photojournalist in milan" "corporate photographer" "event photographer" "fotografo di eventi" "fotografo di eventi milano" "photographer in bergamo" "photographer in trieste" "event photographer milan" "milan photographer"